The new ski jumping hill was completed in February 2010. The first international competitions - Continental Cup and FIS World Cup - were held in march 2010. After final work during 2010, the jump wil be ready for the World Championships in 2011. 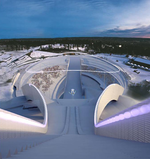 The New Holmenkollen national arena includes a brand new ski arena, new cross-country tracks and the new Midtstubakken ski jumping hill – in addition to the Holmenkollbakken ski jumping hill. “It will be a fantastic arena for spectators and athletes alike”, Roy Evensen, Event Manager for Ski-VM 2011, says. Holmenkollen national arena has an all-encompassing design and a construction which reflects ski sports as outdoor disciplines. A connection to the woods and the use of natural materials from the area is important. Another important issue is that the facilities will be functional for everyone who uses it, also after the WSC. The world’s most modern ski jump! In March 2010, the lights will be switched on at the new Holmenkollen ski jump. “It will be a great day for ski jumping, the inhabitants of Oslo and for the tourist industry. We are looking forward to showing the ski jump off in the trial WSC in 2010”, Roy Evensen, Event Manager for Ski-VM 2011, says.